Do you need professional advice on design, planning, building regulations, masterplanning or project management? extendArchitecture provides advice and a full range of affordable architectural design services to the homeowner, developer, contractor or commercial business. 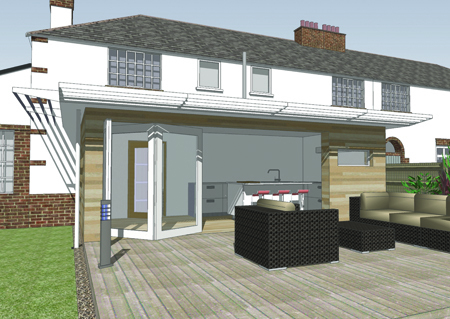 extendArchitecture is an architect-led design service based in Cheltenham, serving Cheltenham, South Gloucestershire and the Cotswolds. Jeremy Dickman-Wilkes of extendArchitecture has nearly 30 years of professional experience in architectural practice with experience in the design and management of residential, commercial, industrial, and healthcare projects. At extendArchitecture, no project is too small. ensures that you arrive at the optimal design solution; exciting, beautiful and sympathetic buildings that will enhance their locations. maintains design quality, whilst at the same time incorporating cost-saving methods and details wherever possible. provides you with best value for your budget and avoids unecessary expenditure. adds maximum value to your property or site. Our clear fee structure gives reassurance to our clients. All of our design services are provided at a fixed cost with no hidden extras or additional expenses. Please note that at present we are not required to register for VAT. extendArchitecture is regulated by the Architects’ Registration Board and Jeremy Dickman-Wilkes is a chartered architect and member of the Royal Institute of British Architects.